Speeches and music from Obama's campaign, inauguration and presidency. These are picks chosen by PRX editorial staff. You can see all potential pieces for President Obama by using our search. Raw audio of President Obama's State of the Union address from February 12, 2013. The journey to the White House, re-mixed in words & music, featuring Bill Cosby, Oprah Winfrey, John McCain, Chris Rock, Colin Powell, George W. Bush, Sarah Palin, Steve Harvey, Will. i. am, Hillary Clinton, Obama himself, and more. Barack Obama - The journey to the White House, reMixed in words & music-introduced by Robert F. Kennedy and featuring Bill Cosby, Oprah Winfrey, John McCain, Chris Rock, Colin Powell, George W. Bush, Sarah Palin, Steve Harvey, Will. i. am, Hillary Clinton, The Pointer Sisters, The Drifters, John Legend, Homer Simpson, Moby, Bruce Springsteen, Ted Kennedy, FDR, The Little Rascals, Kevin So, Branford Marsalis, M.C. Yogi, Martin Luther King Jr, Sam Cooke, John Lewis, Quiet Village, David Letterman, Tim Russert. Katie Couric, Charles Gibson, Matt Damon, Roy Budd, Iron & Wine, Dephazz, Curtis Mayfield & The Impressions, The Edwin Hawkins Singers, various politicians, excited voters...and Barack Obama. Raw audio from President Obama's State of the Union on January 27, 2010. Raw audio from President Obama's State of the Union January 27, 2010. Jonathan Alter, "Newsweek" Senior Editor, and Richard Parker, Senior Fellow at the Shorenstein Center at Harvard's Kennedy School of Government, offer observations regarding the early days of the Obama presidency. Historian and former Clinton speech writer, Ted Widmer, moderates the discussion. Jonathan Alter, Newsweek Senior Editor and columnist; and Richard Parker, Senior Fellow at the Shorenstein Center at Harvard’s Kennedy School of Government, offer observations regarding the early days of the Obama presidency. Historian and former Clinton speech writer, Ted Widmer, moderates the discussion. 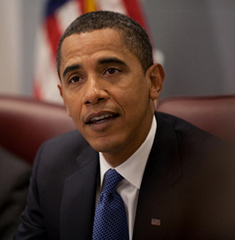 President Obama's first press conference covering the proposed economic stimulus package. President Obama held his first press conference on Feb. 9, 2009 and made his case for the passage of an aggressive stimulus package to relieve the economic crisis facing taxpayers. Explore Barack Obama’s potential as a peacemaker in global and domestic affairs and how he might do as a champion for human rights around the globe. January 20, 2009, newly inaugurated United States President Barack Obama declared a new era for American leadership in promoting peace on the planet, but how likely is it that he'll play the role of peacemaker as president? During the campaign, he pointed to his early opposition to the war in Iraq, while talking tough on other international fronts. While he's said it's important for the U.S. to talk to its enemies, he's appointed a Secretary of State in Hillary Clinton who challenged him on that philosophy during the primary campaign. What in Obama's background suggests that he would be an effective diplomat to bring warring factions together internationally or in Congress over key domestic issues? On this edition of Peace Talks Radio, host Carol Boss and our guests will explore Barack Obama’s potential as a peacemaker in global and domestic affairs. Guests include David Mendell, author of the best-selling book Obama: From Promise To Power. As a former reporter for the Chicago Tribune, Mendell covered Obama’s rise through politics and offers a close-up view of the man’s conflict resolution skill set and history. Also on the program, Dr. Joseph Gerson, Ph.D., author and director of Programs of the American Friends Service Committee in New England. President Obama spoke of a difficult journey ahead that may take years to see through. Before one of the largest crowds ever assembled on the National Mall, Obama also touched on terrorism, hard work, and the struggle for civil rights. Today I say to you that the challenges we face are real. They are serious and they are many. They will not be met easily or in a short span of time. But know this, America – they will be met. On this day, we gather because we have chosen hope over fear, unity of purpose over conflict and discord. In reaffirming the greatness of our nation, we understand that greatness is never a given. It must be earned. Our journey has never been one of short-cuts or settling for less. It has not been the path for the faint-hearted – for those who prefer leisure over work, or seek only the pleasures of riches and fame. Rather, it has been the risk-takers, the doers, the makers of things – some celebrated but more often men and women obscure in their labor, who have carried us up the long, rugged path towards prosperity and freedom. America. For everywhere we look, there is work to be done. The state of the economy calls for action, bold and swift, and we will act - not only to create new jobs, but to lay a new foundation for growth. We will build the roads and bridges, the electric grids and digital lines that feed our commerce and bind us together. We will restore science to its rightful place, and wield technology’s wonders to raise health care’s quality and lower its cost. We will harness the sun and the winds and the soil to fuel our cars and run our factories. And we will transform our schools and colleges and universities to meet the demands of a new age. All this we can do. And all this we will do. Now, there are some who question the scale of our ambitions - who suggest that our system cannot tolerate too many big plans. Their memories are short. For they have forgotten what this country has already done; what free men and women can achieve when imagination is joined to common purpose, and necessity to courage. What the cynics fail to understand is that the ground has shifted beneath them – that the stale political arguments that have consumed us for so long no longer apply. The question we ask today is not whether our government is too big or too small, but whether it works – whether it helps families find jobs at a decent wage, care they can afford, a retirement that is dignified. Where the answer is yes, we intend to move forward. Where the answer is no, programs will end. And those of us who manage the public’s dollars will be held to account - to spend wisely, reform bad habits, and do our business in the light of day – because only then can we restore the vital trust between a people and their government. And so to all other peoples and governments who are watching today, from the grandest capitals to the small village where my father was born: know that America is a friend of each nation and every man, woman, and child who seeks a future of peace and dignity, and that we are ready to lead once more. Let it be told to the future world...that in the depth of winter, when nothing but hope and virtue could survive...that the city and the country, alarmed at one common danger, came forth to meet. America. In the face of our common dangers, in this winter of our hardship, let us remember these timeless words. With hope and virtue, let us brave once more the icy currents, and endure what storms may come. Let it be said by our children’s children that when we were tested we refused to let this journey end, that we did not turn back nor did we falter; and with eyes fixed on the horizon and God’s grace upon us, we carried forth that great gift of freedom and delivered it safely to future generations." On Inauguration Day, WBEZ sent a team of reporters throughout the Chicago area to gather personal reactions to the presidency of Barack Obama. The montage is arranged chronologically, from morning newspaper vendors reading the headlines to a veteran of the Civil Rights movement attending an evening ball. On Inauguration Day, WBEZ sent a team of reporters throughout the Chicago area to gather personal reactions to the presidency of Barack Obama. The montage is arranged chronologically, from morning newspaper vendors reading the headlines to a veteran of the Civil Rights movement attending an evening ball. Along the way you'll hear voices from public schools, retirement homes, factories, the Chicago Board of Trade, the American Legion and numerous other locales. Originally broadcast on January 21 on WBEZ's morning news magazine, 848, this piece captures a complex mix of joy, hope, inspiration, and challenge from the city where Barack Obama began his political career. Interviews with members of the public watching the Inauguration on TV at Philadelphia's Independence Mall. On a blisteringly cold January day thousands huddle around the Liberty Bell, in view of Independence Hall and watch as Barack Obama is Inaugurated as President. All of these are 'raw' un-edited tracks. There are some more files, ambient and voice-over, please contact me if any are required. Ambient audio immediately after Inauguration with crowd cheering and Chris describing scene. Four Obama remixes to complement your Inauguration coverage plans, including speeches from the President-elect, music from Nina Simone, Q-Tip, Kevin So, M.C. Yogi, Dephazz, Will.i.am, commentary from Bill Cosby, Tom Hanks, Artie Lange, John Legend and messages of good will from around the world. Four Barack Obama remixes to compliment your Inauguration coverage plans, including speeches from the President-elect, music from Nina Simone, Q-Tip, Kevin So, M.C. Yogi, Dephazz, will i. am, commentary from Bill Cosby, Tom Hanks, Artie Lange, John Legend and messages of good will from around the world. Can be used as a companion to "Barack Obama-The Remix"
Re-live election night with Obama's full acceptance speech at Grant Park in Chicago. If there is anyone out there who still doubts that America is a place where all things are possible; who still wonders if the dream of our founders is alive in our time; who still questions the power of our democracy, tonight is your answer. It's the answer told by lines that stretched around schools and churches in numbers this nation has never seen; by people who waited three hours and four hours, many for the very first time in their lives, because they believed that this time must be different; that their voice could be that difference. It's the answer spoken by young and old, rich and poor, Democrat and Republican, black, white, Latino, Asian, Native American, gay, straight, disabled and not disabled - Americans who sent a message to the world that we have never been a collection of Red States and Blue States: we are, and always will be, the United States of America. It's the answer that led those who have been told for so long by so many to be cynical, and fearful, and doubtful of what we can achieve to put their hands on the arc of history and bend it once more toward the hope of a better day. It's been a long time coming, but tonight, because of what we did on this day, in this election, at this defining moment, change has come to America. I just received a very gracious call from Senator McCain. He fought long and hard in this campaign, and he's fought even longer and harder for the country he loves. He has endured sacrifices for America that most of us cannot begin to imagine, and we are better off for the service rendered by this brave and selfless leader. I congratulate him and Governor Palin for all they have achieved, and I look forward to working with them to renew this nation's promise in the months ahead. I want to thank my partner in this journey, a man who campaigned from his heart and spoke for the men and women he grew up with on the streets of Scranton and rode with on that train home to Delaware, the Vice President-elect of the United States, Joe Biden. I would not be standing here tonight without the unyielding support of my best friend for the last sixteen years, the rock of our family and the love of my life, our nation's next First Lady, Michelle Obama. Sasha and Malia, I love you both so much, and you have earned the new puppy that's coming with us to the White House. And while she's no longer with us, I know my grandmother is watching, along with the family that made me who I am. I miss them tonight, and know that my debt to them is beyond measure. To my campaign manager David Plouffe, my chief strategist David Axelrod, and the best campaign team ever assembled in the history of politics - you made this happen, and I am forever grateful for what you've sacrificed to get it done. But above all, I will never forget who this victory truly belongs to - it belongs to you. I was never the likeliest candidate for this office. We didn't start with much money or many endorsements. Our campaign was not hatched in the halls of Washington - it began in the backyards of Des Moines and the living rooms of Concord and the front porches of Charleston. It was built by working men and women who dug into what little savings they had to give five dollars and ten dollars and twenty dollars to this cause. It grew strength from the young people who rejected the myth of their generation's apathy; who left their homes and their families for jobs that offered little pay and less sleep; from the not-so-young people who braved the bitter cold and scorching heat to knock on the doors of perfect strangers; from the millions of Americans who volunteered, and organized, and proved that more than two centuries later, a government of the people, by the people and for the people has not perished from this Earth. This is your victory. I know you didn't do this just to win an election and I know you didn't do it for me. You did it because you understand the enormity of the task that lies ahead. For even as we celebrate tonight, we know the challenges that tomorrow will bring are the greatest of our lifetime - two wars, a planet in peril, the worst financial crisis in a century. Even as we stand here tonight, we know there are brave Americans waking up in the deserts of Iraq and the mountains of Afghanistan to risk their lives for us. There are mothers and fathers who will lie awake after their children fall asleep and wonder how they'll make the mortgage, or pay their doctor's bills, or save enough for college. There is new energy to harness and new jobs to be created; new schools to build and threats to meet and alliances to repair. The road ahead will be long. Our climb will be steep. We may not get there in one year or even one term, but America - I have never been more hopeful than I am tonight that we will get there. I promise you - we as a people will get there. There will be setbacks and false starts. There are many who won't agree with every decision or policy I make as President, and we know that government can't solve every problem. But I will always be honest with you about the challenges we face. I will listen to you, especially when we disagree. And above all, I will ask you join in the work of remaking this nation the only way it's been done in America for two-hundred and twenty-one years - block by block, brick by brick, calloused hand by calloused hand. What began twenty-one months ago in the depths of winter must not end on this autumn night. This victory alone is not the change we seek - it is only the chance for us to make that change. And that cannot happen if we go back to the way things were. It cannot happen without you. So let us summon a new spirit of patriotism; of service and responsibility where each of us resolves to pitch in and work harder and look after not only ourselves, but each other. Let us remember that if this financial crisis taught us anything, it's that we cannot have a thriving Wall Street while Main Street suffers - in this country, we rise or fall as one nation; as one people. Let us resist the temptation to fall back on the same partisanship and pettiness and immaturity that has poisoned our politics for so long. Let us remember that it was a man from this state who first carried the banner of the Republican Party to the White House - a party founded on the values of self-reliance, individual liberty, and national unity. Those are values we all share, and while the Democratic Party has won a great victory tonight, we do so with a measure of humility and determination to heal the divides that have held back our progress. As Lincoln said to a nation far more divided than ours, "We are not enemies, but friends...though passion may have strained it must not break our bonds of affection." And to those Americans whose support I have yet to earn - I may not have won your vote, but I hear your voices, I need your help, and I will be your President too. And to all those watching tonight from beyond our shores, from parliaments and palaces to those who are huddled around radios in the forgotten corners of our world - our stories are singular, but our destiny is shared, and a new dawn of American leadership is at hand. To those who would tear this world down - we will defeat you. To those who seek peace and security - we support you. And to all those who have wondered if America's beacon still burns as bright - tonight we proved once more that the true strength of our nation comes not from our the might of our arms or the scale of our wealth, but from the enduring power of our ideals: democracy, liberty, opportunity, and unyielding hope. For that is the true genius of America - that America can change. Our union can be perfected. And what we have already achieved gives us hope for what we can and must achieve tomorrow. This election had many firsts and many stories that will be told for generations. But one that's on my mind tonight is about a woman who cast her ballot in Atlanta. She's a lot like the millions of others who stood in line to make their voice heard in this election except for one thing - Ann Nixon Cooper is 106 years old. She was born just a generation past slavery; a time when there were no cars on the road or planes in the sky; when someone like her couldn't vote for two reasons - because she was a woman and because of the color of her skin. And tonight, I think about all that she's seen throughout her century in America - the heartache and the hope; the struggle and the progress; the times we were told that we can't, and the people who pressed on with that American creed: Yes we can. At a time when women's voices were silenced and their hopes dismissed, she lived to see them stand up and speak out and reach for the ballot. Yes we can. When there was despair in the dust bowl and depression across the land, she saw a nation conquer fear itself with a New Deal, new jobs and a new sense of common purpose. Yes we can. When the bombs fell on our harbor and tyranny threatened the world, she was there to witness a generation rise to greatness and a democracy was saved. Yes we can. She was there for the buses in Montgomery, the hoses in Birmingham, a bridge in Selma, and a preacher from Atlanta who told a people that "We Shall Overcome." Yes we can. A man touched down on the moon, a wall came down in Berlin, a world was connected by our own science and imagination. And this year, in this election, she touched her finger to a screen, and cast her vote, because after 106 years in America, through the best of times and the darkest of hours, she knows how America can change. Yes we can. America, we have come so far. We have seen so much. But there is so much more to do. So tonight, let us ask ourselves - if our children should live to see the next century; if my daughters should be so lucky to live as long as Ann Nixon Cooper, what change will they see? What progress will we have made? This is our chance to answer that call. This is our moment. This is our time - to put our people back to work and open doors of opportunity for our kids; to restore prosperity and promote the cause of peace; to reclaim the American Dream and reaffirm that fundamental truth - that out of many, we are one; that while we breathe, we hope, and where we are met with cynicism, and doubt, and those who tell us that we can't, we will respond with that timeless creed that sums up the spirit of a people: Yes We Can. Thank you, God bless you, and may God Bless the United States of America. Music from the Latin and Latino universe directed at our presidents, including a couple of tunes for President Barack Obama! Beat Latino, hosted by Catalina Maria Johnson, celebrates in every hour a different facet of the extraordinary diversity of the latin/latino musical universe. This hour is all about speaking through music to presidents...if only I were president...Hey Mr. President....the President of Republic...whether from Cuba, Mexico, Spain, Latino musical culture has a tradition of speaking about politics and to politicians. Includes recent examples of cumbias and salsa tunes for Mr. Obama! Comments in English and Spanish, so almost anyone who enjoys this music can enjoy the show. Broadcasts nicely now! All the way to February in celebration of President´s Day. Many Chicagoans know Barack Obama's neighborhood of Hyde Park as a special niche in the city, with unique history and politics. ANCHOR INTRO: For quite a while now, reporters and political opponents have been dissecting Illinois Senator Barack Obama's career. analyzing exactly what made his meteoric rise possible. People have picked through his voting records, who he selected as political mentors, which law firm he chose to work for. Today, we take a look at one of the first and most basic decisions Obama made to get his start, which Chicago neighborhood to move to. Many Chicagoans know his neighborhood of Hyde Park has a special niche in the city, its history, and its politics. In some ways Hyde Park helped make Obama. I am standing at 5429 South Harper Avenue. I'm right outside the three story brick apartment building where Barack Obama lived when he was a community organizer in the late 1980's. It's on the eastern edge of Chicago's Hyde Park neighborhood. After he lived here, Obama went to Harvard Law School and then came back a few years later with plans to go into politics. In 1992, he married Michelle Robinson, and the couple was faced with the choice of where to move and build Obama's political career. Out of all the places they could have picked, they ended up buying a condo just 5 blocks east of here BLACK: It was to his advantage that he started in Hyde Park. Timuel Black is a Chicago Historian and educator. For decades, he's lived in Kenwood, the neighborhood just north of Hyde Park. Black is also a friend of Obama's and occasionally advised him when he was getting started. Black says from the beginning, Hyde Park and Obama were a match. On one side you had one of the most unique neighborhoods in the city. BLACK: Liberal, intellectual and active. In a city that's one of the most racially segregated in the nation, Hyde Park is integrated a good fit for Obama's complex mixed-race background. In a city of blue-collar credentials, Hyde Park revolves around the University of Chicago's good fit for Obama's Harvard Law intellectual background. In a city dominated by machine-style politics, Hyde Park has a history of electing independents appealing to Obama who made an effort to keep his distance from the city's political machine. Black says then you had Obama?s appeal to the neighborhood. BLACK: He had the education, style, charisma, a beautiful wife who was with him, and who'd grown up, not necessarily in Hyde Park but close to Hyde Park, and having friends all over Hyde Park, and he had ambition and he was relatively young. Black says the neighborhood was also more understanding about some things that might have been problems for Obama in other parts of the city. Like that he's not a Chicago native and he could be viewed as a highbrow intellectual. CALHOUN: Do you think a candidate like a Barack Obama, a part-time law professor at the University of Chicago, could have gotten his start in any other area of the city. BLACK: I seriously doubt whether he could have progressed even to the point of state senate in any other part of the city. MIKVA: It would have been a lot harder, and it would have been a lot slower. Abner Mikva is a former federal judge, White House Counsel and Congressman also a long time Hyde Park resident. He's also a longtime friend and advisor of Obama. MIKVA: It was a natural for him to settle here. First of all, the fact that he was an outsider caused no problems for him at all. They couldn't care less if he'd been here 3 months or 30 years. In 1996, Obama won a state senate district that's anchored by Hyde Park. And in the following years he learned the political strengths and weaknesses of the neighborhood. In 2000, he faced the limitations of his neighborhood support when he launched a doomed bid against Congressman Bobby Rush?performing dismally outside Hyde Park. Later, he took advantage of his independent Hyde Park base. Mikva says it was part of what allowed him to rise so rapidly, and part of what put him in position for his 2004 senate run. MIKVA: He was able to leap ahead in Democratic party circles even though he wasn't going the regular route of being a precinct captain, and running for the city council, and then the state legislature, then 20 years later for the congress, then 10 years later, if he's lucky, for the senate. He's leapfrogged all those places because it is Hyde Park. He was a base independent of the party apparatus. Since he catapulted to the national level, Obama's relationship with the neighborhood has changed, especially with some of the people who helped him get his start. He's still very popular in Hyde Park. But behind closed doors and not for attribution, some local leaders will tell you that after his primary win for U.S. Senate Obama cut ties with some of his early supporters in ways that left some sour feelings. There's also a notable split among Hyde Park supporters who were there at the beginning and watched Obama's climb. DOBRY: I'm Alan Mora Dobry DOBRY: I'm Lois Friedberg Dobry Alan Dobry and Lois Friedberg-Dobry have lived in Hyde Park since the 1950's. They're prominent political activists in the neighborhood, and longtime grassroots organizers. Alan Dobry was a Democratic Party committeeman in Hyde Park for 16 years. In 1996, Obama ensured his primary win for state senate by challenging all of his opponents' nominating petitions, knocking them all off the ballot. The Dobrys helped him do it. DOBRY: We were able to show that all these petitions had very serious errors. But these days the Dobrys take slightly different views on Obama. Both still support him, but as Obama has risen to national prominence, on the local level he's allied himself more closely with the city's political machine, including an endorsement of Chicago Mayor Richard Daley. That bothers Alan, who says it goes against Obama's Hyde Park roots. DOBRY: We got him elected as an anti-machine independent, and he has now cozied up to the machine. That doesn't mean I'm going to vote Republican or work for the Republicans, but I'm less enthusiastic about Barack than when I saw him as an anti-machine independent. Lois says she doesn't like seeing Obama ally himself with the political forces Hyde Park traditionally fought, but she understands it. DOBRY: I still look at you know, the way he votes. The way he votes in the senate hasn't changed measurably. He's been a legislator for 13 years. I don't see that he's changed his basic agenda. But I do see that he has looked at the ways of implementing that agenda, and has learned what you have to do to get some of it through. I asked historian Timuel Black what he thought of the Dobrys' differences of opinion. He says it doesn't surprise him because Alan is a purist and Lois is a realist. Black says he understands both sides, and he's heard that debate among Hyde Parkers before. Ultimately, he says he wonders how Hyde Park's values might be reflected in an Obama administration, especially since Obama wouldn't be where he is without Hyde Park. Family and friends who knew Barack Obama when he was growing up in the Aloha State share their insight about how Hawaii helped shape his character and values. As Barack Obama makes history as America's first African-American president, it also marks the first time a native son of Hawaii is now commander in chief. During the presidential campaign, Mr. Obama talked a lot about his community organizing activities in Chicago, and how it led to his bid for public office. But long before that, he was living on a tiny island in the middle of the Pacific Ocean. Those who knew Mr. Obama back then, say the lessons he learned in Hawaii served him well in his campaign and will help him as president. Originally broadcast internationally on Voice of America on August 12, 2008. Updated for the January 2009 inauguration. Barack Obama's grandmother, Madelyn Dunham, inspired not only her grandson, but also many others in Hawaii, where she's remembered as a trailblazer -- one of the first women to become a bank vice president. Throughout his campaign, Barack Obama often spoke about how his grandmother, Madelyn Dunham, poured everything she had into helping raise him, so he could have a better life. During the final stretch of the presidential race, Mr. Obama suspended his campaign briefly to visit his grandmother in Hawaii, who was fighting cancer. Dunham died just two days before his historic election. She was 86. "She raised her grandson to be like her, to know that with hard work and intelligence and education, you could grow up to be whatever you wanted to be," says Alice Dewey, a family friend. Dunham mentored many women and men. "She was wonderful. She was tough. She made you tow the line... On the otherhand, she was fair. She was open, nice and outgoing. She was always trying to help, and that's not always usual in the business community," recalls one attorney. Dennis Ching now heads his own escrow company. He says "I give her (Dunham) all the credit in the world for developing me as the president of my company." While Madelyn Dunham's role in developing the 44th president of the United States is being noted, many will always remember how much she influenced their lives, as well. This piece includes interviews with people who were mentored by Madelyn Dunham in Hawaii's business community, and also family friends. Two versions: Longer version 4:58. Shorter version 4:25. A new version of "O Beautiful for Spacious Skies" brilliantly combined with Rte. 66. A great new version of "O Beautiful for Spacious Skies" brilliantly combined with Rte. 66. It's perfect for Obama's inauguration!! Check out the ending which interpolates new words reflecting the egalitarian spirit of our times. The president discusses his military strategy in Iraq and Afghanistan with Jim Lehrer in Feb. 2009.